For the larger-than-life personalities now staking their fortunes on the development of rocket ships, the new race to explore space could be a dead end, a lucrative opportunity - or the key to humanity's salvation. Elon Musk and Jeff Bezos take center stage in this fast-paced narrative as they attempt to disrupt the space economy, feed their own egos, and maybe even save the world. We also meet a supporting cast of equally fascinating entrepreneurs, from the irrepressible British mogul Richard Branson to satellite Internet visionary Greg Wyler. All are united in the profound conviction that commercial space transportation will transform our world for the better. Tim Fernholz's fly-on-the-wall reporting captures an industry in the midst of disruption, as NASA seeks to preserve its ambitious space exploration program, traditional aerospace firms like Boeing and Lockheed Martin scramble to adapt to new competitors, lobbyists tussle over public funds, and lawmakers try to prevent this new space race from sparking global conflict. 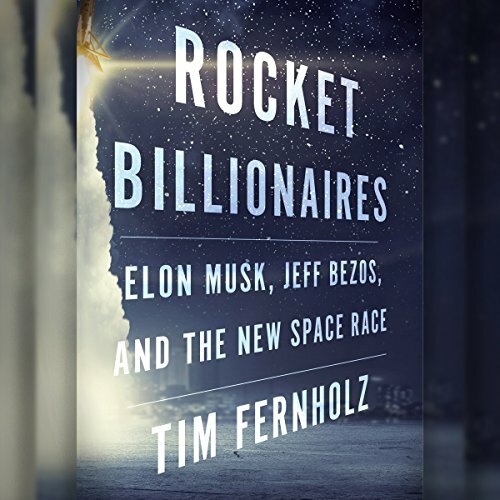 With privileged access to top executives at SpaceX, including Musk himself, as well as at Blue Origin, NASA, Boeing, Lockheed Martin, Orbital ATK, and Virgin Galactic, Fernholz spins this high-stakes marathon into a riveting tale of rivalry and survival. Cover design by Brian Moore. ©2018 Tim Fernholz (P)2018 Audible, Inc.
Great book. There are a couple of minor details that are incorrect but nothing too bad. Performance was decent but a fair number of mispronunciations are present. There is a lot of interesting content in this book, although I was already familiar with most of the incidents described it helped straighten out some of the timeline and players for me, particularly in regards to ULA, Orbital and the Oneweb/Starlink projects. Unfortunately the narration in the audiobook has problems. I think generally Erin Moon did a good job, but her director wasn't paying attention. She swaps words in a few places and makes a lot of bizarre mispronunciations that are distracting. Generally that's forgivable but she pronounces NASA "NasAAH", which I've never heard anyone do, and NASA is in every other paragraph. It's like in the "Good to Great" audio book where NCAA is read as "N-C-Two-A". What planet are these narrators from? Also I was annoyed that some editor somewhere must have though the word "nerd" appeared in the book too much, so changed every instance to either "geek" or "dork". The latter is particularly galling. I don't think engineers have gotten around to enjoying being labeled dorks yet. The editor had plenty of time to make that mistake, since the book leaves off with the first reuse of the Falcon 9 despite being published after the launch of Falcon Heavy. This book is a great overview of the current state of commercial space in America. The author draws on a huge pool of supporting sources and paints a multifaceted landscape of the industry. Unfortunately, this particular performance is plagued with mispronunciation, word inversions and word omission. These performance issues are largely associated with basic technical terms and are fairly distracting. The reader says "Nassau" instead of NASA and if it was said once or twice it would not be a problem, but since the book is about the US space program, she says Nassau about 300 times and it becomes really painful. I wouldn't be surprised if Erin Moon is just the name of a voice from a speech to text system. The quality of the read is just bad... weird pronunciations of things like "NASA". It is just bad. This book was an absolute pleasure to listen to and was very interesting in terms of what is coming in the future of space technology. It’s not as coherent or objective as Space Barons and the reader pronounced words funny like “Nasaw” instead of NASA. It’s mostly just an HJ for Elon. great story telling. a little slow during the politics explanation, but necessary to understand the background. Actually had some top-level engineering details..
.. seems to be rare amongst these type of books. This made up for the fact that the reader couldn't pronounce words like Lagos, Soyuz, or NASA. I always wanted to hear the origin story of Spacex and Blue Origin. I throughly enjoyed reading this book. I have a renewed respect for all the men and women involved in this new industry.